Refinished tub with tinted slip resistant surface. Do you need a non-slip surface for your bathtub or shower? 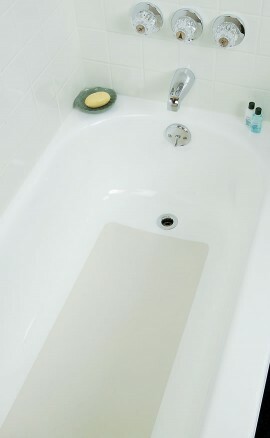 Miracle Method offers a slip resistant surface option for bathtubs and shower pans. It will not only help reduce the risk of slipping and falling, but is also sanitary and easy to clean. This option can be color matched and will not discolor over time. Installed in just one hour, the Miracle Method bonded slip resistant surface will not peel. Many tubs come from the factory with some kind of rough bottom to act as a slip resistant surface. Unfortunately, over time the roughness wears off and does little to prevent slips. Aftermarket options are to use a bathmat, stick on appliqués, or have a slip resistant surface professionally installed. Bathmats can collect mold and mildew and become unsanitary. Removing them regularly is a nuisance. Bathmats with strong suction cups can damage tub finishes if left in place too long. Appliqués tend to collect dirt and mildew. They can also crack and become unsightly. Over time appliqués cause uneven wear of the tub surface so that the outline of old appliqués can become completely etched into the tub finish. A slip resistant surface applied by Miracle Method is chemically bonded to the bathtub or shower. It becomes integrated to the bottom of the tub and won’t crack or peel. Slip resistant surfaces can be applied in a color or coarseness of your choice. If you are interested in having a non-slip surface applied to your bathtub, click on Find a Location or call our toll free locator number, 1-888-271-7690 to reach the nearest Miracle Method professional.